Paradise Hill 2. This pleasant 2 storey house is located within a communal village setting, just a few minutes off the Sukhumvit road, in a quiet yet convenient area. It is easily accessible to schools, Bangkok Pattaya hospital, and even the shopping and beaches of Pattaya City. 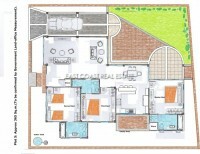 The property is sat upon a 100 wah² plot of land and offers spacious living area. On ground floor entrance is also a nice open terrace with garden views, and beyond there is a large open living space, leading through into the rear European and Thai kitchen area. On the first floor are all the bedrooms which are bright and airy. Two of these comes with en-suite bathrooms and every room has air conditioning. All of the modern conveniences such as high speed internet, satellite TV are already connected. The house is offered for sale partially furnished with title deed held under Thai name. Taxes and transfer cost to be paid solely by the Buyer.